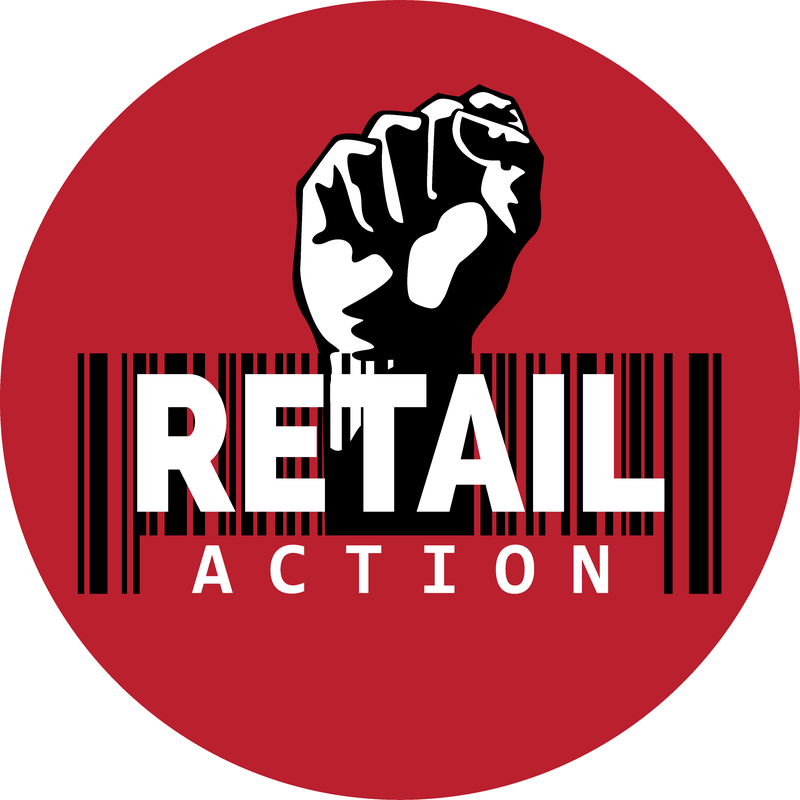 The Retail Action Network is a solidarity network of workers and labour activists that fight for workplace justice, increased wages, and better conditions for retail, food service, and hospitality workers. We aim to strengthen the working class community across workplaces and industries. Through direct action and community organising we fight for changes that benefit workers in retail, service, and hospitality. Our practice takes influence from a wide range of workers’ movements, past and present, that fight against exploitation and oppression. We organise in Lkwungen, W̱SÁNEĆ, and T’Sou-ke Territory, also known as Victoria BC. The displacement of indigenous people from here and around the world, through colonialism, has historically been the backbone of capitalism and a vehicle for the extraction of resources. Working class people through history, displaced from their own communities, have been pawns to enforce the violence of colonialism. This process continues today. Colonialism has important and real implications for why and how we organize workers. Centuries of resistance to capitalism, and colonialism have shaped today’s labour movement. Just as the economic landscape of work has shifted from manufacturing in factories to being predominantly service based, so too must our methods of organising workers in the 21st Century. Since capitalism’s establishment of neoliberalism in the 1970s, manufacturing jobs have been shipped to countries for cheaper labour, unions have been attacked and weakened, and have declined in number, and the prevalence of precarious work in the service industry has increased. Meanwhile, workers’ rights have remained stagnant or even reverted to lower standards — as a whole, failed to adequately protect workers in a changing labour environment. The precarious, isolated working conditions we find ourselves in today make it nearly impossible to organise in the traditional union sense. We must adapt our organising strategies and tactics while still cultivating a similar level of solidarity that labour unions have historically provided for the working class; a real change must come from the action of the many. Through our solidarity network we look to strengthen and build autonomy among the workers in the most precarious employment, often the ones neglected by the big unions, and create far reaching solidarity throughout the community. We approach this work from a grassroots understanding in recognition of worker’s led movement. If a single worker is being abused at their workplace and is unable to unionise, we believe the community of workers can best support them. As the saying goes: an injury to one is an injury to all. Through direct actions of solidarity across workplaces and industries we hope to develop class consciousness and collective confidence within the community, so that we are more willing to take our lives into our own hands. For too long we have had our lives forced by fear of hunger, through coercion and intimidation, to be manipulated by employers and disconnected politicians. The power imbalance between workers just trying to survive and the bosses making profits off of us through exploitation must be confronted. By celebrating our victories and taking direct action, we aim to build a greater recognition of the importance and effectiveness of collective and communal action. We recognise that community is not monolithic or static, but is a conglomeration of different individuals with their own distinct experiences and who are part of multiple communities. Workers’ rights must always take into account the numerous forms of oppression certain members of the general community endure. Fighting these oppressions is essential for working class liberation, for the vast majority of workers experience some combination of oppression. We realise independent organising according to race, gender identity, ability, sexuality, and other forms of oppression is necessary to address issues specifically as an oppressed community, and we give such struggles our support. As well as exploiting and oppressing the majority of people, capitalism threatens the world through the destruction of the environment. The struggle against this destruction, like the other struggles must be tied to the working class; we are the majority of the world and we are the people affected first and most by environmental degradation. We emphasise, that the capitalist society disconnects and weakens us, but that our exploitation as workers lays a foundation upon which we can all unite, in our largest numbers, across all divides, to bring about systemic, large-scale change. Intersectionality therefore is key to our struggles. Cooperation among different organisations and struggles is necessary in order to create significant positive change for the exploited and oppressed under capitalism. We desire to create a place where such collective action can blossom. We do this through our regular and engaging events. We declare that our collective efforts must be the leading method of the exploited and oppressed to achieve progress towards liberation. History has shown that relying on the kindness of the employer to pay us living wages, relying on the momentum of big unions to stand up for the isolated workers in precarious work, relying on disconnected politicians with different class interests to implement changes have all proved to be inadequate options. Although we recognize that a variety of tactics are necessary in our struggle, as workers in these industries we can best understand and put into practice the true changes we need. The Retail Action Network will do everything in its power to help all workers consolidate to achieve these changes — not a few years down the line at the next election, not even a month or day from now, but today at this very moment.